Joanne called me in tears; her pain was palpable. She’s been in an unhappy marriage for 12 years. There was love there at one time, but that was so long ago, she couldn’t remember what that feeling of love felt like. There was no intimacy; there was no affection and she was slowly, but surely, losing her joy. Their relationship now felt more like roommates on the good days and adversaries on the worse days. She knew long ago that the relationship would not last forever, but she had convinced herself that she could stay until the kids graduated high school so they weren’t impacted by a separation and divorce. But now, things have changed for her. She simply cannot keep living, simply existing, like this any longer. Joanne knows that she cannot stay and she is burdened with worry and fear about the impact this next step to leave the marriage will have on her kids. We all come by our beliefs and expectations about love pretty honestly; we learn the most through the example set by our parents and our families. Maybe you married a man just like your father. Maybe you are a woman that engages with her husband in the same way your Mom engaged with your Dad. Because that’s the example you saw; that was the lens through which you saw relationships. 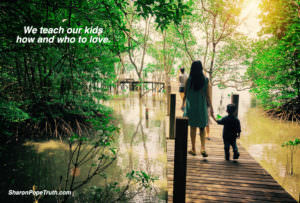 When we treat our husbands with kindness and compassion, our children see that. When we shut down from our husbands, our children see that as well. Their future choices about who to allow into their hearts and how to be in relationship with another person will be consciously or unconsciously based upon what they experienced at home. Our kids will learn so much more about how to live and how to love from our actions than they ever will our words. This isn’t an area where we can tell them, Do as I say, not as I do. Parenting is, by far, the most difficult job on the planet and some days it feels like we do everything wrong. Leaving an unhappy marriage may not be the right answer, but it’s not always the wrong answer. If you’ve made the incredibly difficult decision to leave an unhappy marriage and worry that you’ve somehow damaged your children forever, be gentle with yourself. Although there’s nothing you want more than to protect your children from change and pain and worry or doubt, it’s a virtually impossible bar of perfection to live up to. Sometimes the best we can do is to show up and be present for ourselves and our children; we can be real, open and honest. Sometimes the best we can do is to show them how we acknowledge and honor our own needs, giving them permission to do the same for themselves. On our best days, what our children need is our love and belief in both them and ourselves.